The portage from Bob Lake to Diamond Lake done, we had originally planned to paddle up the north arm of the Lake that same afternoon to check out the pictographs. Having done a less-than-satisfactory job of documenting the rock painting site on our last visit in 2009, this time we planned on doing better! However, the wind and the waves had their own agenda, so we ended up camping on a small island at the south end of the arm. We hoped that by the next morning there would be less wind and no rain. Morning came and the weather for the next three hours would be the best of the entire five days of our early October trip. 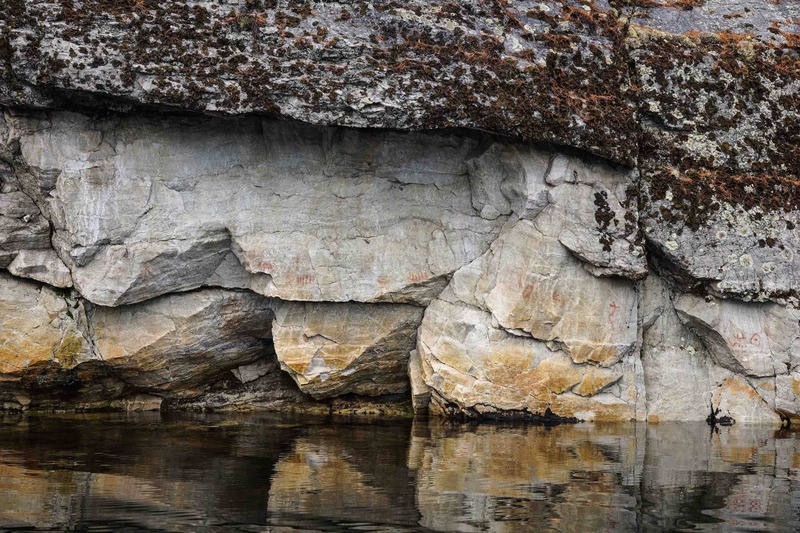 We paddled the 2.6 kilometers to the pictograph site on the west side of the arm on completely calm water. In my thoughts was the withering conclusion about the meaning of the Diamond Lake pictographs delivered by Canada’s then pre-eminent archaeologist David Boyle over a hundred years ago. As Phillips noted in his report, the ochre markings are spread out over a ten-meter length of the white quartzite surface. Overhead ledges protect the painted markings from the worst of the run-off water. They face east/southeast and are thus spared the worst of the winds from the NW. 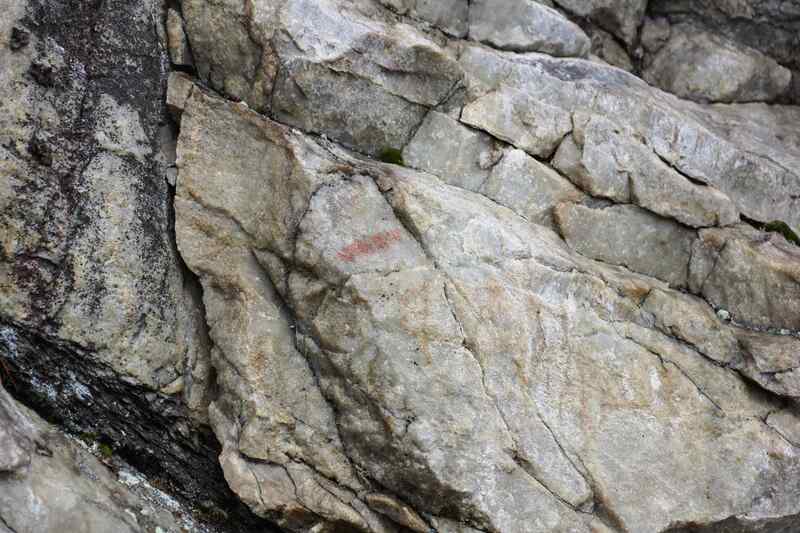 The above photo shows the site from the north end with the dot in the circle as the last of the pictographs. This would explain why parts of the Diamond Lake pictograph site were under water when Dewdney visited in 1959. 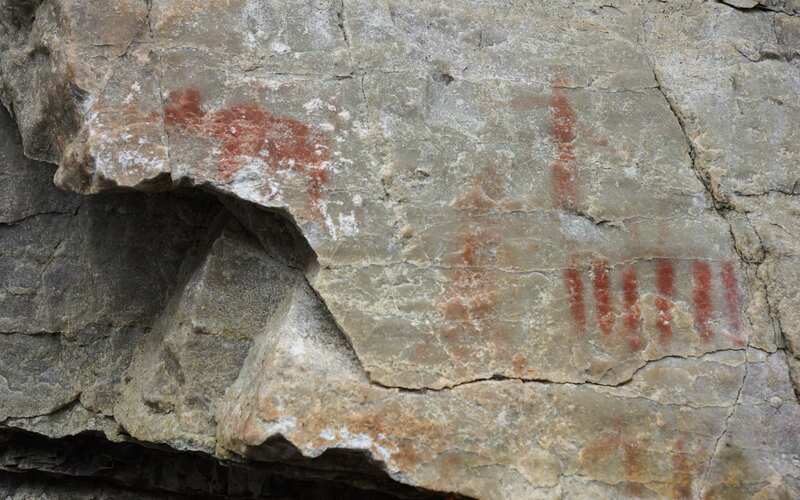 Since Dewdney, with a few exceptions, there has been very little discussion and research of the Diamond Lake pictographs – or of the pictographs of the Temagami area in general. One exception is the work of Thor Conway. It was Conway who as a young archaeologist visited the Diamond Lake site with Dewdney in the mid-1970’s and who continues to publish material on pictograph sites all across the Canadian Shield area. His book on the Agawa Rock pictograph site, for example, stands as the definitive study of that Ojibwe rock painting location. Conway first visited the Diamond Lake site in 1974. As luck would have it, the previous year the dam had been destroyed by a work crew from the Ministry of Natural Resources and the water had come down to its natural level. Two years later he was there again with a CBC film crew. Along for the visit were Dewdney and Gilles Tache, a Quebec archaeologist also focussed on the pictograph quest. During their visit, they were able to determine that water levels were lower by about 4.5 feet (1.37 meters) from where they had been on Dewdney’s 1959 visit. The dynamiting of the dam in 1973 made that much of a difference. 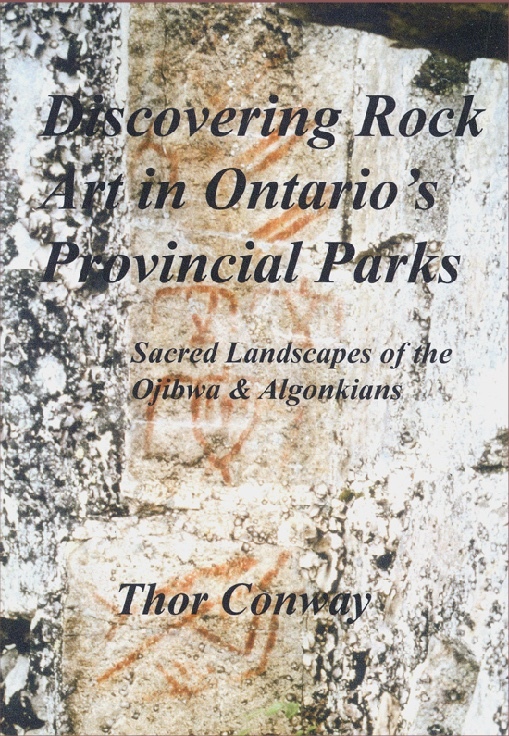 Conway’s book Discovering Rock Art In Ontario’s Provincial Parks (2009) has a chapter on the Diamond Lake pictographs. Though the 2009 book is impossible to find, the fall of 2016 saw the publication of a revised edition of the book with 35 pages of introductory material followed by 240 of discussion of twelve rock art sites across Ontario. 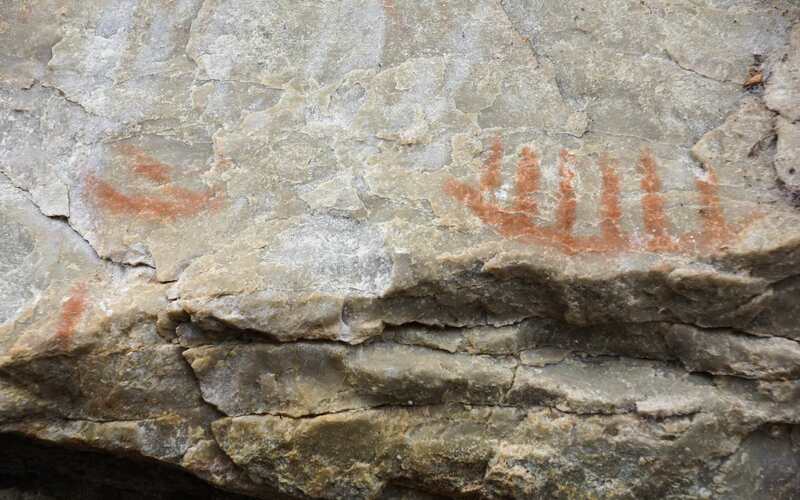 Titled Discovering Rock Art: A Personal Journey With Tribal Elders it preserves the traditional knowledge of Ojibwe elders from across northern Ontario which the Conways had gathered in their years spent in various First Nations communities. 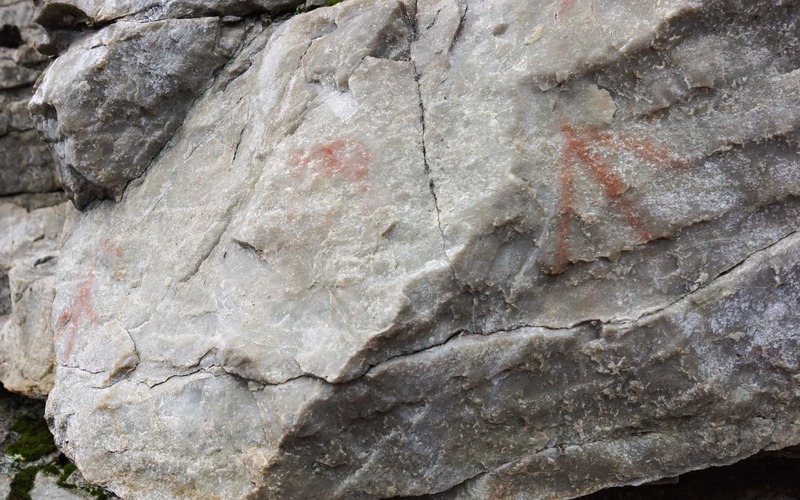 Any reader will come away with a deeper understanding of the Anishinaabe culture behind the images painted with hematite on rock faces across Ontario – and of the Canadian Shield in general. The book is available at Amazon and from Thor Conway himself. The very first site Conway examines in detail is the one on Diamond Lake. We approached the pictograph from the south. The following sequence of images follow the ten meters of rock face from south to north. In doing so we followed the order in which Phillips presents his drawings of the various pictographs. Conway has counted 77 individual ochre marks or paintings in the entire site; we were not as successful! The site begins at the south end with some indecipherable ochre marks and concludes some ten meters or so further north with the most well-known of the Diamond Lake rock paintings. They were “painted” with a mixture of ground hematite and perhaps fish oil or bear grease and then applied to the rock surface, not with a brush, but by finger. The figures are usually no more an inch (2.5 cm) wide and up to five or six inches long. As I mentioned in another pictograph-related post, people are sometimes disappointed when they see them. In the grand scheme of things, these are admittedly very rudimentary expressions of the values and beliefs of a Palaeolithic culture. However, they speak to anyone who has experienced the rugged beauty of the Canadian Shield. The photo above is of the first of them, three ochre marks of which what may be a star pattern or a figure with outstretched arms is the most visible. The next evidence of ochre comes just a meter further north. Still visible is what looks like a T. It is with this pictograph that Phillips began his drawings of the Diamond Lake pictographs; it is #1 in his inventory. There is an ochre smudge above and to the right of the T but it is badly eroded. Bloodvein River shaman – and medicine bag? We have now moved up about four meters of the site. So far there is very little to make sense of. 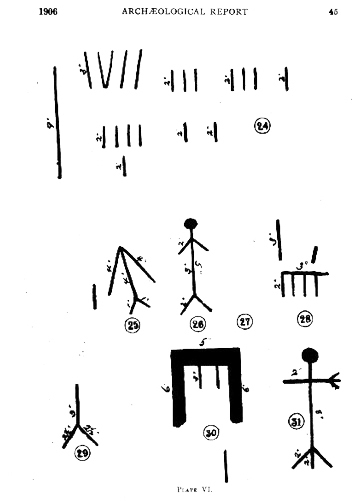 We were now looking at what seems to correspond to pictographs #2 and #4 on the top of Phillips’ Plate IV above. The ochre marks in between could be #3. It is impossible to say from the image below. Are we are looking at crane footprints being used as a clan emblem or are we are looking at rudimentary Thunderbird images? Conway comments that the Phillips #3 drawing may represent an otter skin. If so, it certainly would be an abstract rendition of the otter’s skin laid out flat. It was of otter skin that a shaman’s “medicine” bag would typically be made. Philips’s #3 can be seen at the bottom left of the image below. 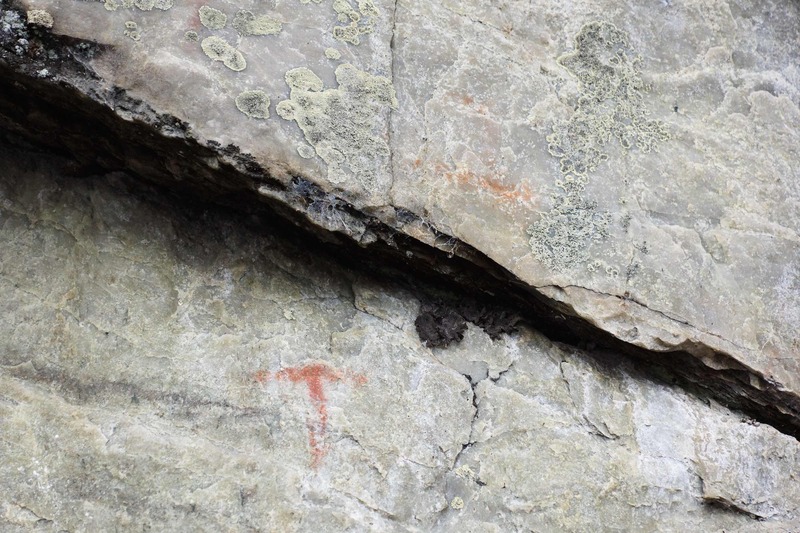 Diamond Lake – Thunderbird pictographs or Crane footprints? 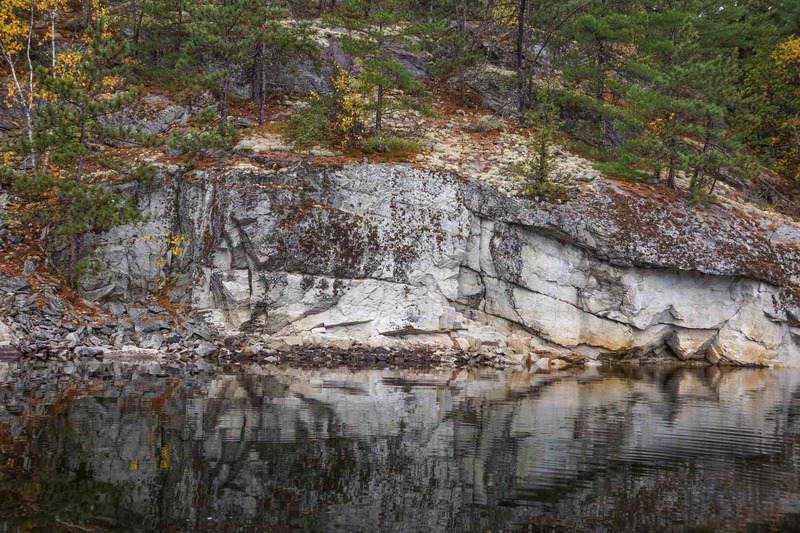 It is also possible that the slab of rock just broke off from the rock face and fell into the water below, Seeing a copy of the supposed Dewdney drawing or description would help. However, if a painting has indeed been removed I am left wondering why Phillips did not include a drawing of it on Plate IV. All of the Phillips drawings from #4 to #7 are visible on the rock face. 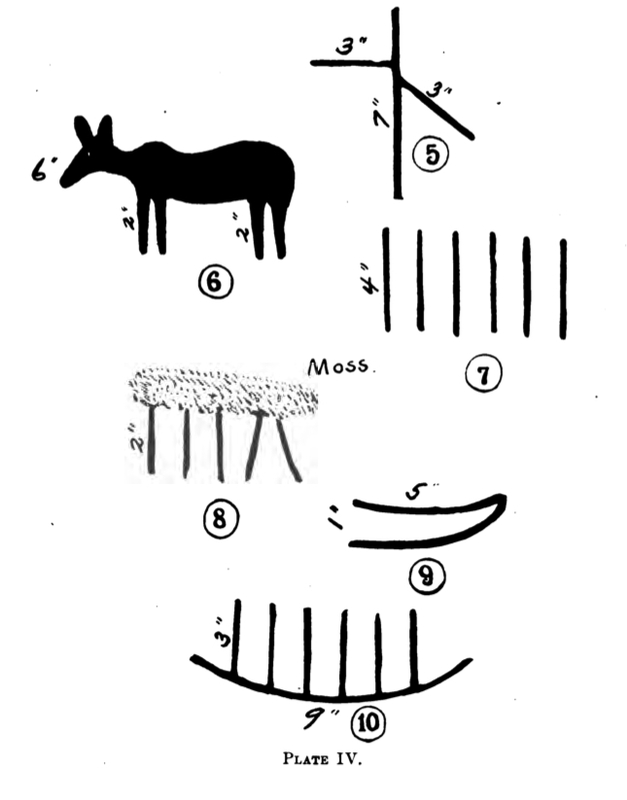 If there was indeed a pictograph striking enough to motivate someone to remove it from below the moose image, Phillips would have included it along with all the others. Update: A visit to the Ottertooth forum turned up a 2006 thread (click here) which discusses this very topic – scroll down the thread a bit from Ed’s initial post and you will find the following statement from Ed – and then a whole lot of response! 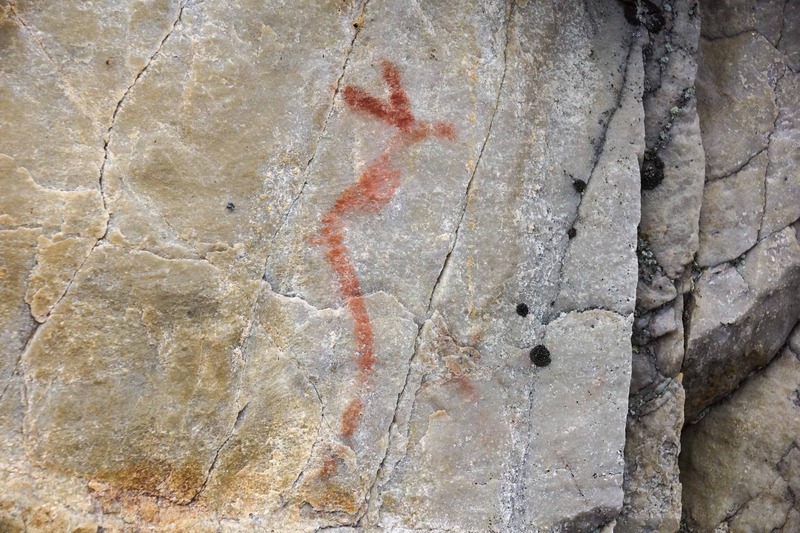 The space underneath the moose pictograph is identified as the claimed location of the missing pictograph. Do continue reading the thread on page 2 where you will find Brian Back’s summation of the evidence. Included is a photo from 1954 – five years before Dewdney – which shows the area around the moose pictograph looking pretty much as it does now. So just what did Thor Conway and Backroads Bill think was vandalized? Very interesting! #10 (usually interpreted as a canoe with 6 paddlers, an image meant to convey the strength and power or of a hunting party). Looking more closely at the panel, other faint and lines can be seen, with the highest one looking like Phillips #8 with the five fading vertical lines. All that is missing these days is the moss! Click on the photo below to enlarge it and see for yourself. 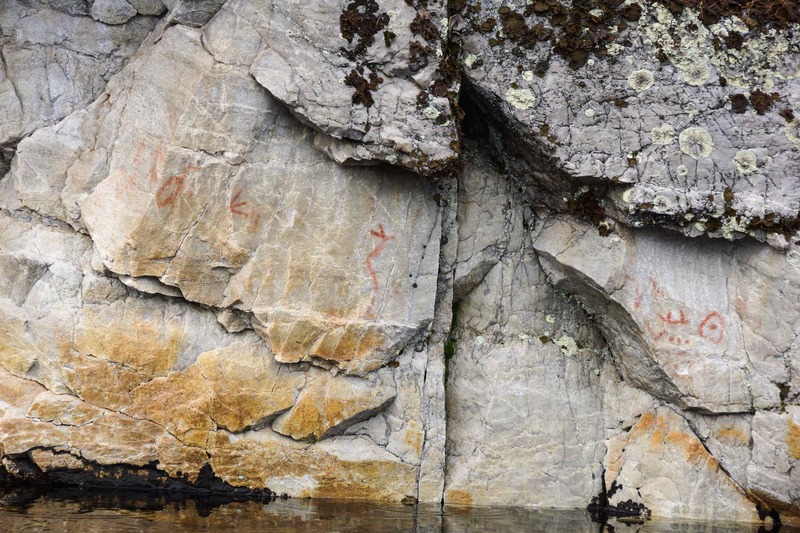 Dewdney devotes very little space to the Diamond Lake pictographs in his book. The one quote above, along with the sketch of the core of the site, and the quote which follows is pretty much all he had to say. #12 the maymaygwayshi, though it hardly seems like a vestige! #19 the circle with the center. #16 is perhaps included in his catch-all phrase “stick figures”. Picking up on Conway’s comment, #11 and #13 possibly represent the otter skins associated with the shaman’s medicine bag. It is surprising that Dewdney did not identify Phillip’s #16 as the horned snake of Anishinaabe myth. #17, looking very much like a square root symbol, is another stick figure. Not mentioned by Dewdney are the three dots, what looks like a canoe with two paddlers, more crane or heron footprints, and other impossible-to-say-what marks. As if to point out the problem of saying exactly what it means, Dewdney concludes his comments on the site by noting this about the circle with the dot – Ending the statement with an exclamation point does point out that these two inventories, both from the mid-1800’s, come up with different meanings. 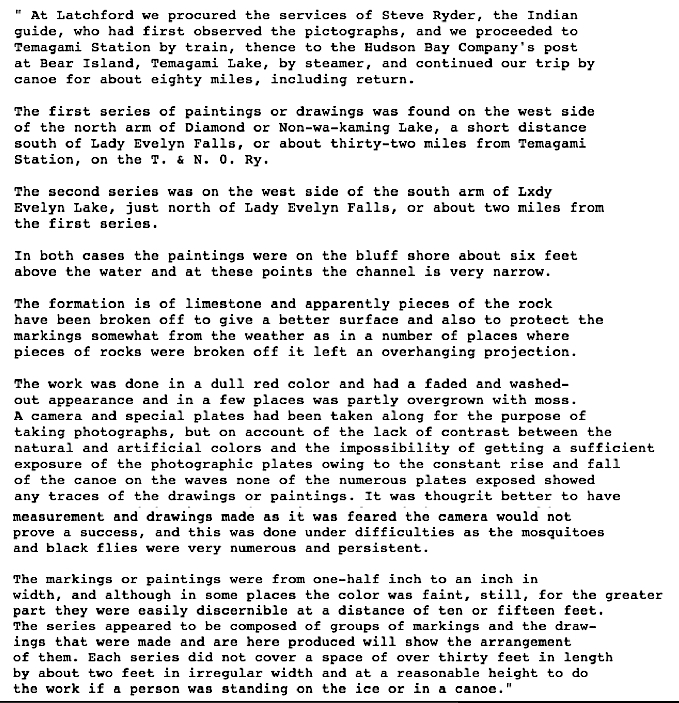 Already noted was David Boyle’s statement near the end of the 1907 article “Rock Paintings At Temagami District”. He wrote: “It would be utterly vain to look for any interpretation.” In spite of that, he could not resist offering an interpretation and ends up proving his own point! Rather than see the site as it is – associated in Anishinaabe tradition as the home of the maymaygwayshi and other powerful medicine spirits to which a number of shamans came over an extended period of time – he sees it as a tablet on which one person has written a “sentence” or two using the pictographs as script. This one person, he writes, has written a “story”. Boyle is able to state quite categorically that the first sentence ends near the top of Plat VI! Oddly enough, the article ends with that assertion. I flipped the page, expecting to see a continuation somewhere but that statement is it – a peculiar way to end the article. 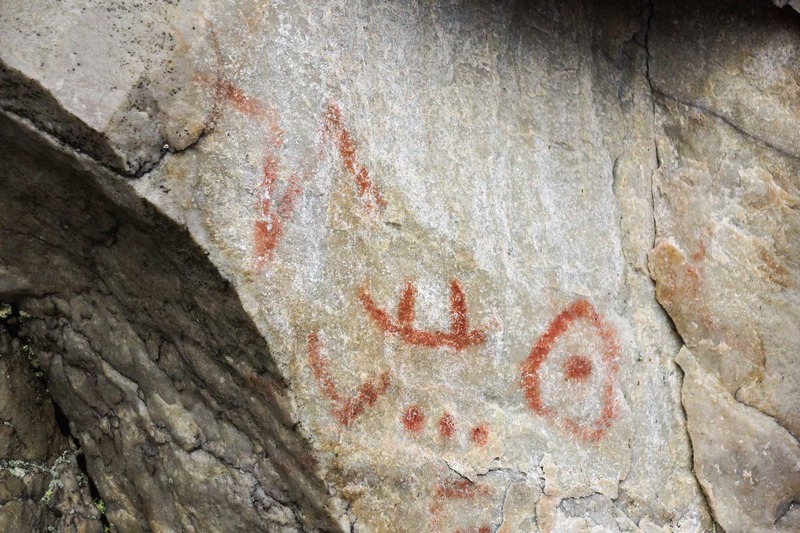 To conclude, Boyle seems to be a victim of the notion that the pictograph site represents an application of a coherent Anishinaabe writing system. It is almost as if he sees the cliff face as another birchbark scroll. 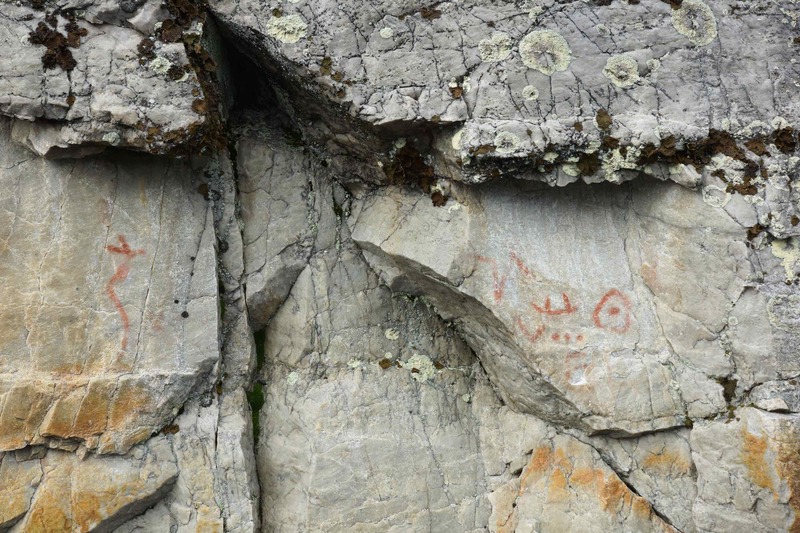 There is no Rosetta Stone – in spite of the conflicting mid-1850’s inventories of symbols and their meanings left by Schoolcraft and Copway – to help us unravel the meaning of the Diamond Lake pictographs. 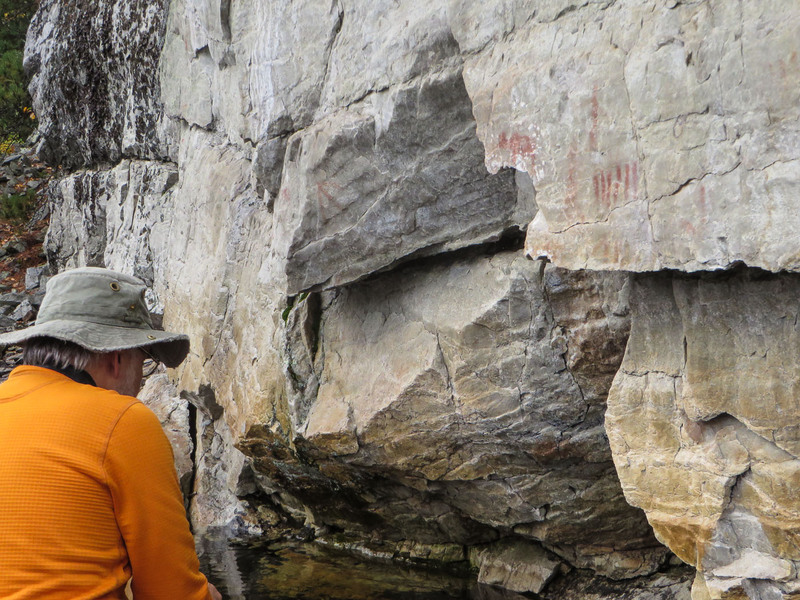 However, those who have visited have given us more insight into the nature of pictographs and their significance. Boyle’s “utterly vain” can be amended to “much is still puzzling”. Thanks to more recent visitors we can now better see elements of the Anishinaabe worldview in the ochre, from possible references to their clan (doodem) system and their religious beliefs. As we paddle past the dramatic quartzite rock face, the least we can do is stop and appreciate the fact that maybe two or three hundred years ago Anishinaabe shamans stopped at this same spot. 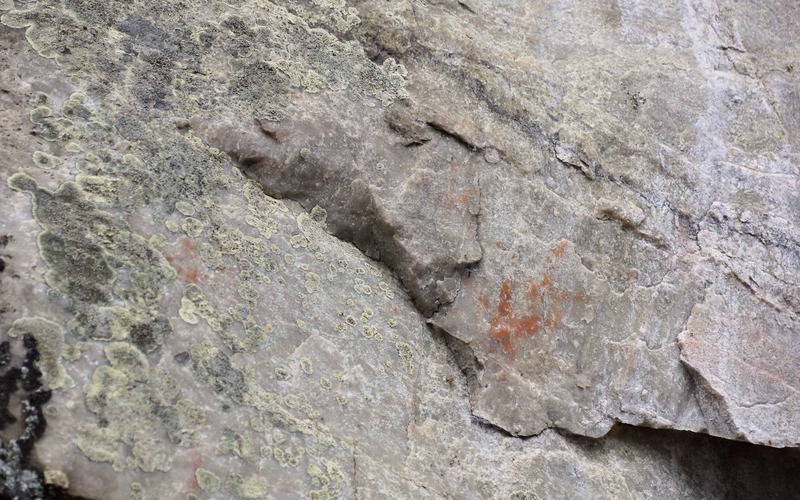 As a part of a vision quest, perhaps, or as a visit to the home of the maymaygwayshi for powerful medicines, the rock paintings were part of the ritual. 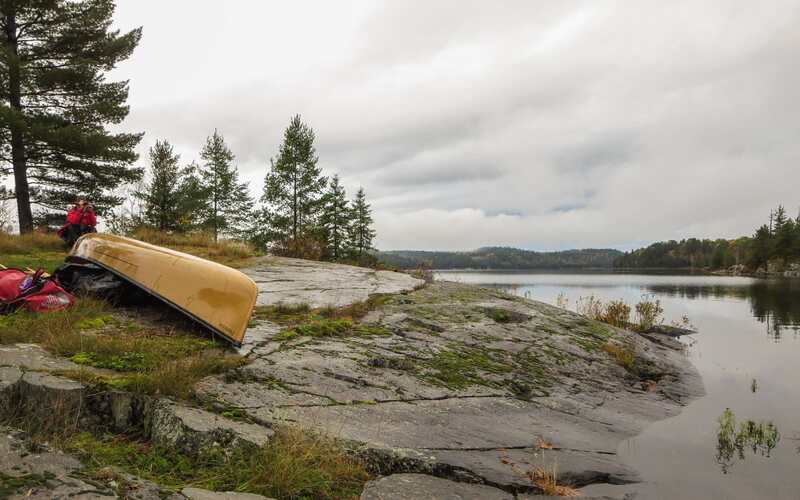 From their birch bark canoes, they reached out to the rock and created enduring marks with their specially prepared mixture of finely ground hematite and fish oil. While we will never completely understand the significance of all the ochre paintings, we still stop and for a brief while enter into another world. Just click on the blue text to access material. You can access the pdf file of W. Phillips’ “Rock Paintings At Temagami District” here from my WordPress site. 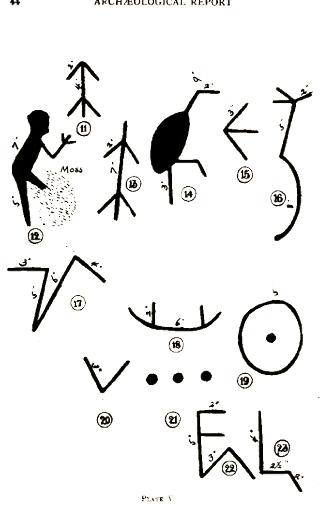 If you want to see where it came from, look here – The Annual Archaeological Report for 1906 (Being Part of Appendix to the Report of the Minister of Education Ontario) published in 1907.
the 1962 first edition of Selwyn Dewdney’s Indian Rock Paintings of the Great Lakes is available for online reading or download. It documents the first 109 sites he visited. A second edition of the book came out in 1967 with documentation on an additional 155 sites. By this time his quest had taken him far beyond the field of study as stated in the title! Thor Conway’s Discovering Rock Art: A Personal Journey With Tribal Elders can be purchased directly from the author. 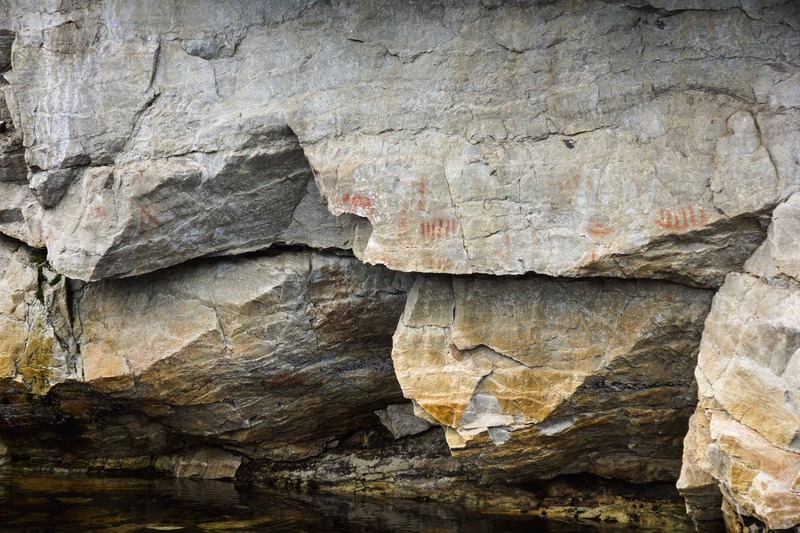 The Thor and Julie Conway article on the Lake Obabika pictographs – “An Ethno-Archaeological Study of Algonkian Rock Art in Northeastern Ontario, Canada” – provide excellent background to the Diamond Lake pictographs, which are briefly mentioned in the article published in issue #49 of Ontario Archaeology in the mid-1980’s. Brian Back’s Ottertooth article “The Lady Evelyn Lift-Over” provides an excellent historical summary of the impact of dams on water levels on Diamond Lake and Lady Evelyn Lake. 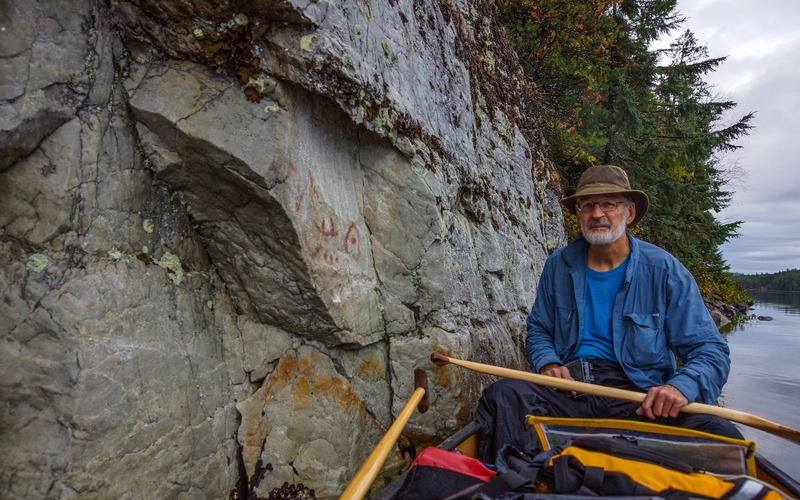 Dewdney mentions Cuttle lake in his discussion of the Diamond Lake rock paintings. Grace Rajnovitch’s article “Paired Morphs At Cuttle Lake” is in the Jan/Feb 1980 issue of Arch Notes, the newsletter of the Ontario Archaeological Society. It includes drawings from one of the panels and provides a point of comparison. Another collection of Diamond Lake pictograph photos can be seen at the temagami.nativeweb.org site. The pix show some of the pictos from a better angle than our shots do. 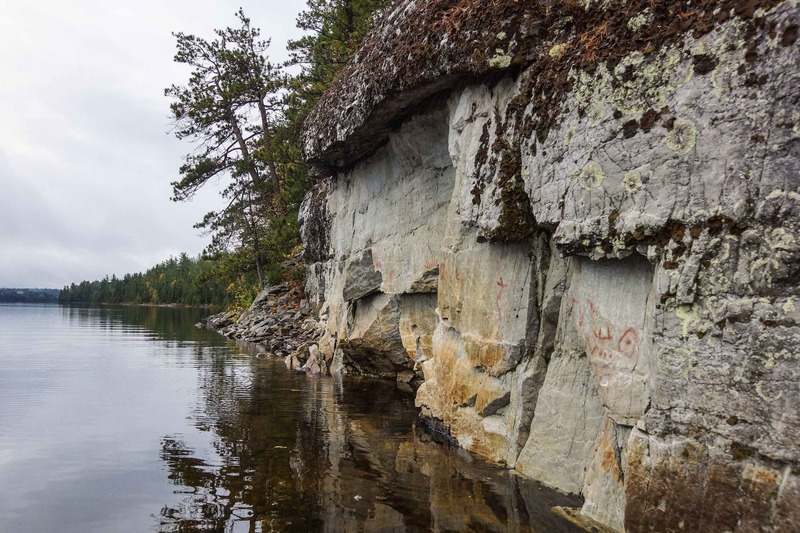 Go here – Ancient Pictographs at Diamond lake in Temagami How ancient they are is an open question. My guess would be no more than four hundred years. Finally, I wonder whatever happened to the film footage shot by that CBC crew in 1976 for that episode of This Land. This entry was posted in Pictographs of the Canadian Shield, Temagami, wilderness canoe tripping and tagged Conway Diamond Lake, David boyle pictographs, Dewdney Diamond Lake, Diamond Lake pictographs, Diamond Lake vandalism, Discovering Rock Art In Ontario's Provincial Parks, forked snake diamond lake, Lady Evelyn Falls Dam, Ojibway horned snake, Ojibway rock paintings, Rock Paintings At Temagami District, The Lady Evelyn Lift-Over. Bookmark the permalink. Another comprehensive article on one of my favorite subjects. I visited the site 2 years ago on a canoe trip in Temagami. I also have Conway’s book, but I don’t really like it, as it seemed to digress from the topic at hand. I remember Irene Dewdney telling me that she didn’t like it all. Bruce, thanks for the positive review. It wasn’t quite finished yet but I just figured I’d let it go and post it anyway. 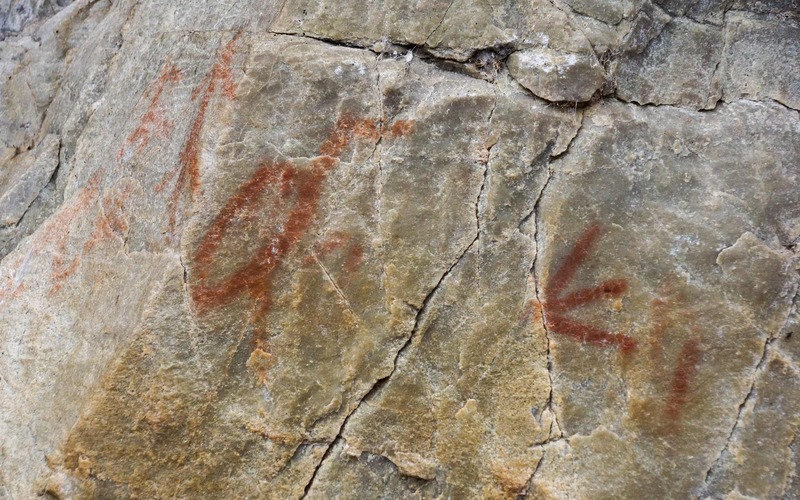 I still want to incorporate some material from Rajnovich to explain some of the pictographs. Your use of the term “comprehensive” is very kind! An alternative title for the post might be – (More Than) Everything You Wanted To Know About the Diamond Lake Pictograph Site! I can get quite obsessive about things I take on! The Conway book I have on the Agawa Rock site is vey useful. I have yet to find a copy of the book on the Ontario Provincial Parks. Without a doubt his overall approach is somewhat different than Dewdney’s. The Matachewan area has not come up in all the research I’ve done but you may be right. It would be great to see some images of drawings and a specific location. All in all there are not a lot of recorded sites east of Lake Nipigon. This summer we spent a week on the Steel River system just west of Matachewan. No pictographs to report from that area although Dewdney mentions a site on McKay Lake just east of Long Lac. We didn’t get up that far and are not really sure where that site is supposed to be located. You could spend days paddling McKay’s shoreline looking for something which may not exist! Let me know if you come up with some solid info. I’d love to add it to the list of known sites in Ontario. My cousin is coming from Australia next year & would be interested in your work. Do you guide in Northern Ontario? Would he & his wife be able to join you to see rock paintings on the Spanish River & elsewhere in Northern Ontario. We are from Spanish, Ontario. Marvia, thanks to your question I just put a “Follow” button on my home page! – Fairy Point on Missinaibi Lake – also difficult to do as a day trip but would be possible with a motorized boat from the Backlay Bay put-in. A great book to put all this into context is Thor Conway’s Discovering Rock Art: A Personal Journey With Tribal Elders (2016). The book covers most of sites I listed. Tell Joc to get in touch with me if he wants more info or suggestions. Philips mentions a second site on Lady Evelyn Lake just north of the Lady Evelyn Falls. Has it all been washed away by the higher water levels? I note that he was there before Lady Evelyn Lake was dammed. I’m often there in the winter but there is no ice on the water north of the Lady Evelyn Falls for about 300 m to go look. In the winter the water level would be about the same as when Philips was there. Have you any idea how far north and was there any drawings so we could look. I might haul a canoe down the lake some winter to explore that area. If you read the Philips account in my post he mentions that the site is about two miles from the Diamond Lake site. I used that bit of info to estimate the location. Let me know if you have any luck. It wouild be quite the find! Unfortunately I will not have time to go up there this winter. The ice is quite solid in that area and there are some white cliffs there. I usually snowmobile by there 2 or 3 times a winter but almost always on the east shore just because of momentum of turning the corner just to the north. March is the most opportune time to go since the water level is down and there is less snow cover on the ice.